April end marks 3 days of significance for mobile internet industry stalwarts as the leading mobile conference, Global Mobile Internet Conference (GMIC), initiates on 26th April 2018. It is one event that brings advertisers from around the world together to exchange ideas and discuss changes that are significantly impacting the mobile ecosystem. The tech industry is abuzz with the news that about 3000+ industry leaders, about 40,000 audiences and, thousands of viewers are going to eye the event to get real-world insights of the industry and to channelize ideas into actions. Team mFaaS will be exhibiting its real-time mobile ad fraud prevention and analytics platform at the venue. Drop by to get a live demo of how mFaaS’s real-time ad fraud prevention platform can help you evade advertising & monetization losses. The industry has had its eyes closed to ad frauds for years and consequently, the fraud community has seeped into the core of the system where they could attack your ad campaign and advertising assets at any stage. According to a research report by Juniper, the advertising industry is estimated to lose about $19 billion to frauds by 2021. The situation is grimmer than it sounds, as fraud today impacts all players in the ecosystem causing significant loses to advertisers, networks, and publishers. While for advertisers, fraud leads to misleading conclusions on campaign performance, thereby reducing ROI and losing precious advertising budgets (mostly VC funded), for networks and publishers, the zero-sum game makes it a loss for many. mFaas has been recognized and awarded as the best big data analytics platform by IAMAI (Internet and Mobile Association of India), 2017. 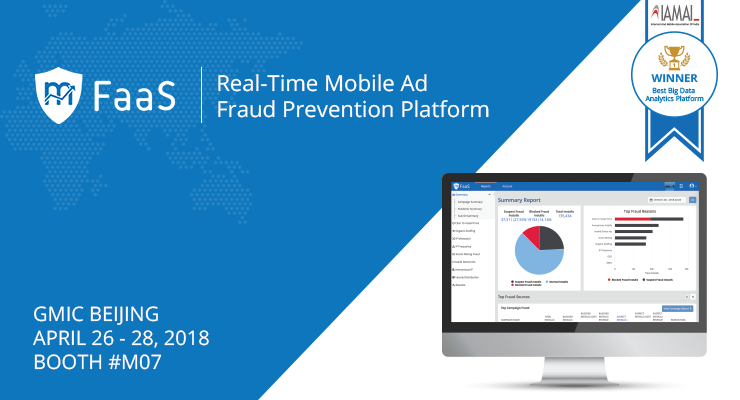 The award-winning mobile ad fraud prevention and analytics platform helps marketers detect fraudulent traffic sources and blocks the same on run-time, thereby optimizing the quality of campaigns. With advanced monitoring algorithms, mFaaS enables you to filter out dubious traffic patterns & raises timely alerts, allowing you to set different thresholds, one for detecting and another for blocking fraud. On the server or network level, the algorithms detect fraud based clicks, action events, IP pools, device ids and more. Some of the fraud types which mFaaS helps to easily detect are organic hijacking with click stuffing/spamming, device fraud/spoofing, device farms/vpn fraud, bot traffic, and IP fraud, APK scams/versioning fraud & ad stacking. Having an interactive reporting dashboard, you get an insight into fraud happening at campaign, publisher and sub-id level, thereby introducing granularity into detection. Moreover, it gives you features to manage your cost and revenue related to traffic you are buying and the relevant effect of fraud on your overall margins. Features like threshold configurator help you in managing margins smartly. The dashboard also showcases a split view of total, suspect and blocked traffic for a quick insight into campaign quality, having a break up of top frauds by reason codes – a set of algorithmic checks. Looking For A Fraud Combat System? Catch-up @ GMIC! Fraud requires attention and immediate action. Catch up with team mFaaS at booth #M07 to get a live demo of the platform, or drop a mail at connect@mtraction.com to know more. Next PostClick Injection Explained: How To Combat Mobile Ad Fraud For High-Quality User Acquisition?